In my travels today, i found a Custom Edition (Fender type) in white (off-white) with a gold pickguard. Here is a link to what it looks like, and what it possibly could even be. My question is, how much would one of these be worth these days? I looked through the catalogs and only found one in the 1986 catalog. If it is an '84, i thought it was in pretty good condition considering the age, but i'm not sure of the Fender types. It was a pretty decent playing guitar. Although i do believe the pickups have been upgraded. This is a top of the line custom edition strat (SD653) and they weren't exactly cheap in the 80's, at least not in Sweden. I don't know what it could be worth today but I prefer it to the pointy headstock models. It first showed up in 1986 and were in production at least until 1991, I have a warranty card for a SD653 from -91. The body is either ash or alder, both were available. Would you happen to know if that is a licensed Floyd Rose Locking Tremolo on that guitar? Also, the price on it was a little less than $300, without a case i believe. Yes, the SD653 had an Ayers Rocker V trem which was licensed by Floyd Rose. The earlier versions were not. I have a JSX70 that has an Ayers Rocker III trem, it works fine but the V version is probably better. $300 sounds like a good price to me. The original pickups should have L. White printed on them. BTW if the headstock is the slightly modified Tokai version it's probably an ASD653 (US version). The SD653 had a retail price of 65,000yen. The '3' part of the number refers to the pickup configuration (S/S/H). It is shown on page 8 of the 1989 catalog and in the 1986 catalog. From memory they were only offered with rosewood fingerboards. The body wood used was ash for white color and alder for black or candy red color. The $300.00 price is excellent value. You will really enjoy the guitar, which is really a TST60 but with active electrics and Ayers Rocker V tremelo for the 5,000 yen. It definately won't be an '84 as the Custom Edition guitars were not released until mid-86. They should have a different serial numbering to the Traditional series too. I finally bought the guitar a few days ago as a birthday gift with the intentions of playing it for a while and then selling it to a friend in the states. It does have a few "issues" that i dont see as a big deal, but does take away from the greatness of the guitar. 1) The gold pickguard is cracked at the tone control knob. One 1" crack heads towards volume knob and other heads in opposite direction. 2) The tremolo bar has a little play in it. Like it could use a rubber bushing to prevent it from sloping back and forth in the nut in goes through. 3) The neck isnt rosewood like i heard (and seen in the cataloges here)these were supposed to be. It's the typical maple fender type fretboard with dark dot inlays. 4) Looks like someone placed an aftermarket neck pickup (humbucker) in the bridge position. (treble strings are way off center off the pole-pieces). Some good things about the guitar. 1) It's sound gives me the urge to not play my other guitars, ever! 2) I love that tremolo. Just like i read on a review of it on harmony-central. I can dive it till the strings are hanging loose and when it returns, still in tune. I cant believe how well it stays in tune! 3) I havent had this much fun in long time playing a guitar like this. The two single coils are in fact original (l white on them), and it looks like the bridge humbucker is aftermarket. If anyone can place a year on this, that would be great. I will post pics tomorrow when i borrow my friends digi-cam. Dana: Sounds like a fun guitar! You think that your friend will actually get it? I wanna see the pictures when you take 'em. Posted: Fri Aug 02, 2002 9:09 am Post subject: Posted to pics....but not too good quality. I brought the guitar to a friends house and tried to snap a few pics using his digital camera but didnt have much luck, especially trying to rush and take them. Also, it didnt help that the camera didnt have a zoom feature, so i apologize for the poor quality. I'm gonna borrow the camera this weekend and take some pics of all my gear. Not sure if i'm gonna sell it. After buying and and buying a case for it, it was probably more than i wanted to spend. Also the Yen to dollar rate didnt help. Dana, is the trem arm removable? 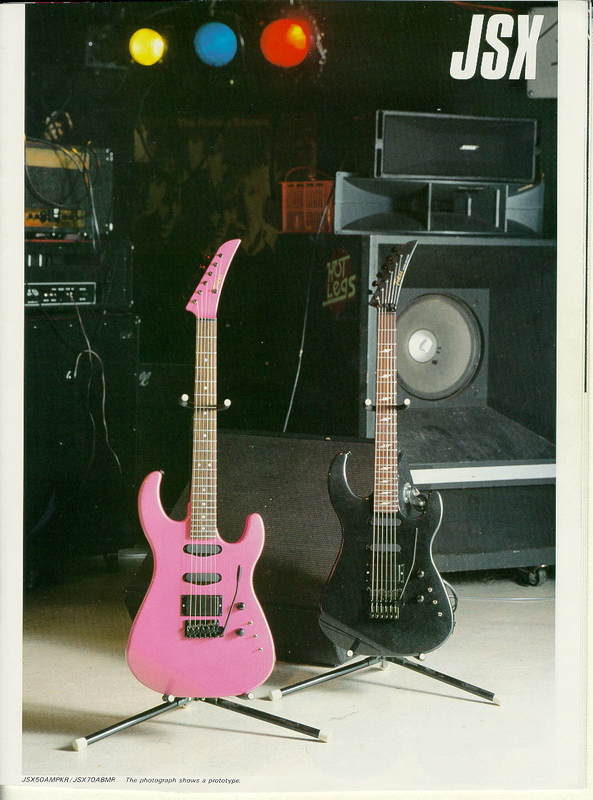 They were not on the original (first version) Floyd Rose trems. If it's not it could be the same problem my Schecter custom strat with an original Floyd had, there is a nylon washer that get bad after some time. It didn't help tightening the nut on the back of the trem arm in the end so I bought a removable arm instead. There is a conversion kit for this and I guess the Floyd arm will fit the Ayers Rocker. In Sweden it cost about $23. The trem arm is removable as in i just unscrew the arm (which just barely clears the fine tuner screws). So that kit is only to changes to a removable arm kit where the one on it (original?) had hardware attached to the arm and wasnt meant to come off (at least easily). I'm looking in the stew-mac catalog and see a trem arm with all kinds of goodies attached to the thread end. I need to stop being chicken and just take it apart slowly and see whats the problem. This is my first tremolo (good tremolo), and i hear they are a pain to set up, but a dream to play afterwards. I went to another store today and saw what looked like much newer Tokai Custom Editions. These were all red and had the appearance of low quality and when i picked them up and played them, they cried "set us down and let us die" (lol). The inlays were dots the size of the screw heads that adjust pickup height. Everything was painted (hardware) and didnt have anything shiny. Anyways, not to slam the guitars, but i didnt see how they could have Custom Edition on the headstock. 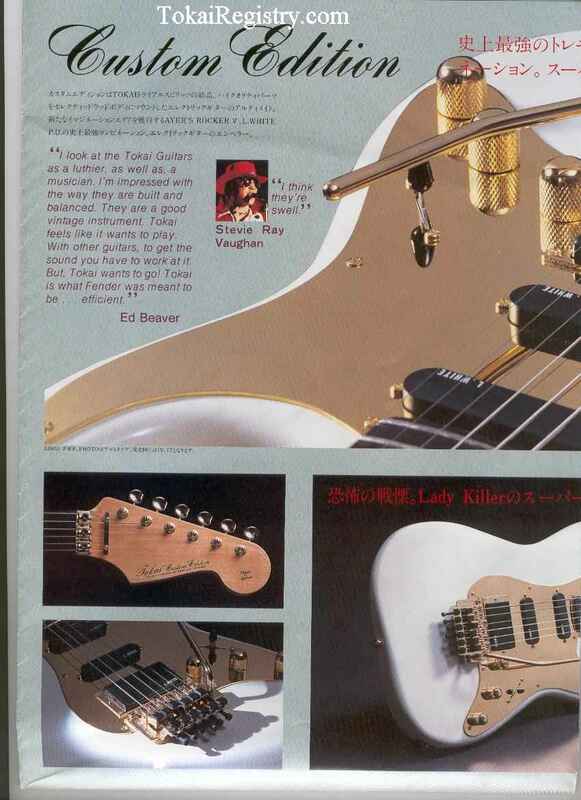 It might be a korean guitar, check this page (http://www.tokairegistry.com/images/catalogs/tokai20014.jpg). The Super Edition on that page must be a cheap korean guitar. I have a 1986 japanese Super Edition JSX-70 (http://www.tokairegistry.com/images/catalogs/tokai_85-86_electric_p8.jpg and http://www.tokairegistry.com/images/catalogs/tokai_85-86_electric_p9.jpg) which is a fantastic guitar, it has the best neck I've ever played. The finish on the guitar is also excellent, and yes, it's pink with lightning inlays . The only thing letting it down is the single coil pickups, the humbucker is really good. I posted some better pictures of the guitar. Note: The camera i used didnt have a zoom, so the headstock looks huge in some pictures. It isnt. Notice how far the treble strings are off the pole-pieces of the bridge pickup. This is also the first guitar with active pickups i've owned. Can i put any pickup in the bridge or is there special pickups that are needed for active electronics? Will it have a year on the bottom of the neck if i took it off? Or is the only indicator the numbers on the neckplate. I keep wanting to dislike this guitar, but the more i play it, the more i like it. I havent played the Love Rock since i got this. The pole peice gap is a common problem when a "Gibson" humbucker is placed in a "Fender" guitar because of the 2 different string spacings these Companies used. The most common remedy involved placing the H/B at an angle so the string would pass through the middle of the 2 pole peices ( 1 is adjustable, the other is not) and get the full attack. The introduction of "Strat spaced" humbuckers allowed for this variance but the bridge H/B on your guitar has is obviously not. I would recommend trying to fit an active electronics H/B size pickup to keep the original look and sound of the guitar intact. EMG, Duncan, Fender - all have replacement AE pickups or try to find if Lawrence White Pickups still manufacture - even Bill Laurence P/U are a great sub. Good Luck. I would be interested in finding out the neck and body markings on your guitar as I did not get the opportunity to dismantle one when I worked for Tokai. Sorry but the serial number is not an indicator of age but... as most of the Custom Edition had 7 digit numbers....I would guess yours would be early '86 due to the "L" plate. Probably one of the first series released. Good score.